Ben Franklin's Small Business Chamber launched to strengthen the True Grassroots! NEW CHAMBER TO RESTORE TRUE GRASSROOTS. Ben Franklin himself kicks off new effort. Citing a lack of political voice for Colorado's entrepreneurs, veteran community activist John Wren announced today that on Friday (Aug. 3) he incorporated Ben Franklin's Small Business Chamber of Commerce, Inc. with goals that include having 20,000 Colorado small business owners go to their neighborhood caucus in 2008. Applications for charter memberships and the founding Board of Directors are being accepted from owners of small businesses (less than 300 employees). Contact JohnSWren@aol.com or (303)861-1447. 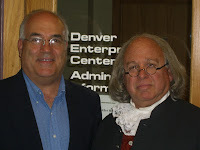 Wren made the announcement at the Denver Enterprise Center, 3003 Arapahoe in Denver, with Ben Franklin impersonator, actor Chris Lowell www.BenFranklinLive.org. Wren said, "I chose to employ the Franklin icon with the new chamber because we will be organized around Franklin's unique concept for peer support groups that I've used here in Denver since 1996. Franklin said, 'Individuals Associated can accomplish more for themselves, and their society, than they can in isolation.' Also, Franklin has been a source of inspiration for many entrepreneurs and their supporters since the very beginning of this country." "We will not lobby or endorse political candidates or issues, but we will educate entrepreneurs to be more effective. Like the stated purpose of the Denver City Club, of which I'm a past-president, we will seek to inform rather than reform. Our primary tool will be the adult self-directed learning groups or peer advisory groups called Franklin Circles. Other activities being planned at this time include: Aha!—Members Only Wiki and Monthly Newsletter; weekly workshops & seminars; mentoring assistance; and City-Wide Seminars starting in Denver next January 17, Franklin’s 302nd birthday. "This new Ben's Chamber will not compete with existing chamber of commerce groups or trade associations. Rather we intend cooperate with them to revitalize the True Grassroots in business and politics, to help individuals associate so they can accomplish more for themselves, and for our society, than they can in isolation," said Wren. "The USA used to be a nation of shopkeepers, but we are rapidly becoming a nation of clerks working for large corporations. Our founding fathers were small business owners; we must get more of today’s business owners involved in local politics and government if we are to preserve our Republic." John S. Wren, MBA+ www.JohnWren.com is an adult educator and consultant. He is now president of the Denver South Optimists Club, and a member of the board of directors of the Denver Lions Club. He is the past-president of the Rocky Mountain Direct Marketing Association, the Denver City Club, the Colorado College Republicans, and the University of Denver Graduate Students Association. He is one of the founders of Save the Caucus which defeated Amendment 29 in 2002 which would have destroyed the neighborhood caucus-assembly system for nominating to the primary ballot. He currently serves as a Denver GOP District Captain. He formed the first Franklin Circle in Denver in 1996, based on the group Franklin formed in 1727 in Philadelphia.